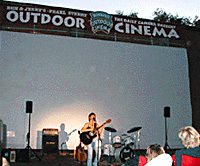 The Boulder Outdoor Cinema features live music and short movies before darkness falls and the show begins. Admission: $5 adults, $3 kids 12 and under, free for kids under 3. Cash and checks accepted. Our 2003 season began on Friday May 30, 2003 and runs through August 30, 2003. Rain dates will play the weekends of September 5th and 12th if needed. Our feature presentation starts by 9:00 PM. Pre-movie shorts and live entertainment are often featured before the feature starts. Gates open at 7:00 PM. Seating is general admission, but you may be directed toward the rear of the crowd if you bring high-backed chairs. Our front half of the venue is reserved for low back chairs. We still encourage couches and other whacky seating.